Only authenticated users can access the ntopng web GUI. After a successful authentication, ntopng creates an authenticated session and send it to the web user inside an HTTP cookie. From that point on, the web user will be able to transmit the received session back to ntopng inside another HTTP cookie along with every request made. ntopng, upon seeing the session, will recognize the user and consider he/she as authenticated. Session handling is generally done automatically by the web browser of the user. This means that cookie handling and session transmission will be transparent to the web user and handled behind the scenes. Authenticated sessions have a duration. After an amount of time equal to the session duration, the session is terminated and ntopng will no longer recognize it, requiring the web user to re-authenticate again. The session duration is configurable as shown in the following picture and can go from 1 minute up to 7 days. The shorter the session duration, the more secure the ntopng accesses are. Indeed, a compromised session could be used by an attacker for the whole duration time. It is up to the administrator to choose a duration that can guarantee enough security, depending on the environment of the operations. The administrator can also decide to terminate all the active sessions at midnight, simply by toggling the preference shown in the figure. This will force all the web users to re-authenticate again, regardless of their residual session duration. ntopng supports multiple methods to authenticate users into the ntopng gui. 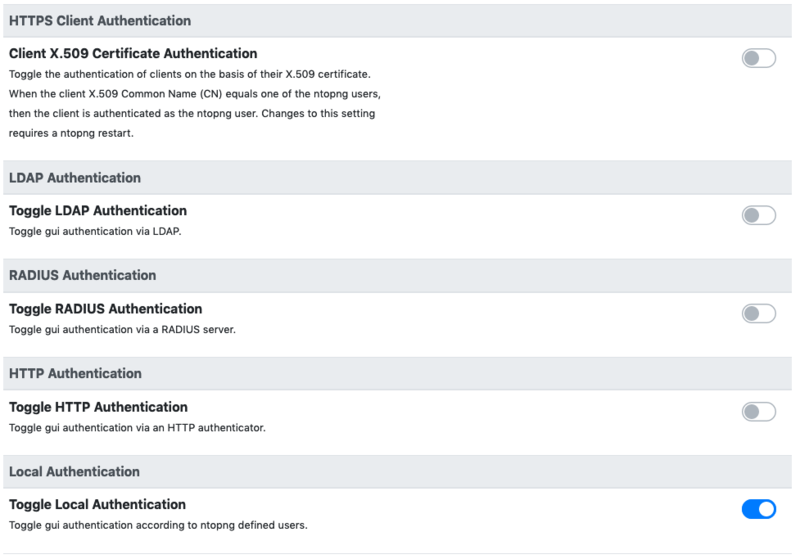 Individual methods can be enabled from the ntopng “User Authentication” preferences. It is possible to enabled more than one method at once. 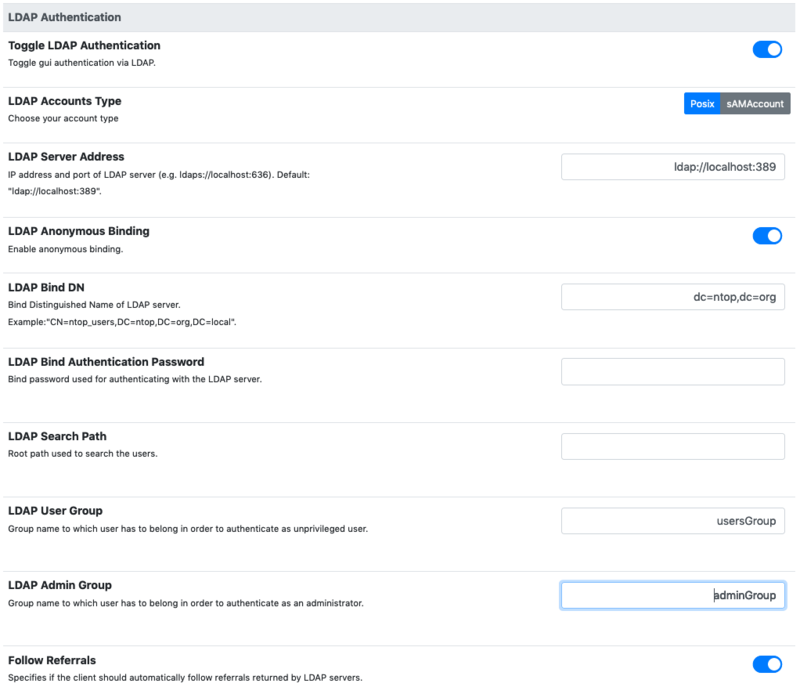 In this case, when a user tries to authenticate, the enabled authentication methods will be tried in the same top-down order as they are listed in the preferences. If at least one of the authentication methods succeds, then the user is allowed to access the web gui. This is the authentication method enabled by default when ntopng is installed. It will use the users credentials configured via the ntopng gui to authenticate new users. An LDAP server can be used to authenticate users. LDAP Accounts Type: can be used to choose for the Posix based accounts or the sAMAccount accounts. LDAP Server Address: the address of the LDAP server. Ports 389 and 636 are the default ports for ldap and ldaps, respectively. LDAP Anonymous Binding: based on the LDAP server configuration, performing an LDAP binding request (needed to communicate with the LDAP server) may or may not require authentication. If anonymous binding is disabled, then explicit credentials must be supplied. LDAP Search Path: this indicates the root path where users and groups information are located and is used by ntopng during the login. LDAP User Group: the value for the “memberOf” user attribute used to identify normal users (without privileges). See the readme at the end of this section for more information. LDAP Admin Group: the value for the “memberOf” user attribute used to identify admin users (with privileges). See the readme at the end of this section for more information. On a Linux client, it is possible to test the connection to the LDAP server with the following commands. ldapsearch -x -h ldap_server_ip -b 'dc=mydomain,dc=org' -s sub "(objectclass=*)"
ldapsearch -h ldap_server_ip -D 'cn=binding_user,dc=mydomain,dc=org' -w binding_password -b"dc=mydomain,dc=org" -s sub "(objectclass=*)"
The parameters above should be modified according to the actual configuration in use. It is important to configure the LDAP server properly in order to correctly expose the necessary group metadata to ntopng, otherwise authentication will not work properly. The following link contains recommendations to be applied to an OpenLDAP server for ntopng communication: https://github.com/ntop/ntopng/blob/dev/doc/README.LDAP. RADIUS Server Address: the address (IP/hostname) and port of a radius server. The default RADIUS port is 1812. RADIUS Secret: the secret to authenticate with the server. RADIUS Admin Group: the name of the admin group to be returned by radius as the value of the Filter-Id attribute to be used to identify admin users. All the other users are considered unprivileged by default. The following link provides more information on the RADIUS setup for ntopng: https://github.com/ntop/ntopng/blob/dev/doc/README.RADIUS. the authenticator will respond with the HTTP code 200 if the authentication is successfully, otherwise another (unspecified) code is returned. in case 200 is returned, JSON data will be sent back to the ntopng server. If this data contains a admin = True pair, then the given user is authenticated as admin. Otherwise, it is authenticated as a normal unprivileged user. This will try to authenticate a user called test-user with a password test-password on a local http authenticator running on port 3001. The following link provides some information on how to setup a simple HTTP authenticator to work with ntopng: https://github.com/ntop/ntopng/blob/dev/doc/README.HTTP_AUTHENTICATOR . Instructions on how to recover after being locked out of the ntopng gui can be found in the FAQ page.